1 lazy magnolia | This Blog Rules | Why go elsewhere? We’re starting our weekly local, craft, micro, any cold beer sold in the states not Bud Light reviews. We thought it’d be a great opportunity to share our knowledge about the latest and great beers from all around the country. The writers at ThisBlogRules.com are located all around the country, and will be getting their chance to showcase their favorite beers. You can submit your own local or craft beer review at ruleblog@gmail.com and we’ll try and get it up during one of our reviews. Registering a 4.39% ABV, Southern Pecan is a relatively light 6-pack, but if you and your friends like Brown Ales, this creative southern twist is sure to be a hit. Brewed with pecans, this beer has an obvious nutty flavor, but the Brown Ale behind the nutty flavor combines to bring a lighter, smoother taste than other Brown Ales. 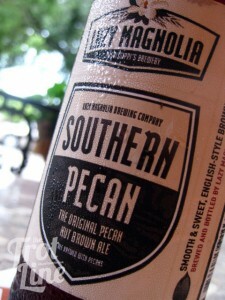 Lazy Magnolia’s Southern Pecan is also brewed with lots of caramel flavor, and you’ll be hard pressed not to smell or taste that right away. 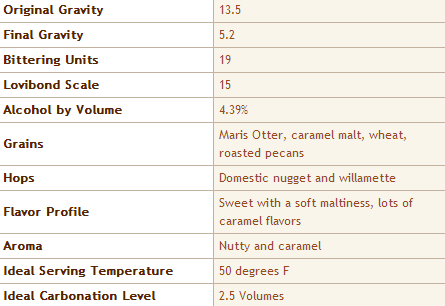 The label claims it’s the Original Pecan Nut Brown Ale, and we’ll give them the benefit of the doubt for now. Lazy Magnolia was founded as the first craft brewery in Mississippi in 2003, and has been serving up creative concoctions ever since. They officially have 5 other types of beers: Southern Gold, Deep South, Jefferson Stout, Southern Hop’spitality, and Indian Summer. Unfortunately, I believe this beer is only available in TX, LA, GA, FL and TN, but if you live in or visit any of those states, be sure to pick some of this up.